To be clear, this guide doesn’t have 20 steps because it’s complicated. On the contrary, there are 20 steps because this is the easiest way to plainly explain and follow the DIY credit repair process. So instead of paying an expensive credit repair company to do it for you, do it yourself – for free – with this helpful guide. Thanks to the Fair Credit Reporting Act, you are entitled to see your credit reports – from all three national credit bureaus – every 12 months. AnnualCreditReport.com is the official site for making this request. Though you can stagger your requests throughout the year – looking at one of the three reports every 4 months – when you’re ready to start the credit repair process, it’s important to ask for all three. 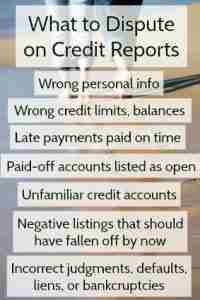 Everything that’s dragging down your credit can be traced back to your credit reports. So, your first priority is conducting an in-depth analysis of errors on your reports that could be corrected, as well as negative listings that need to be addressed. As you go through the credit repair process, it’s important to track your progress. So, before you do anything else, sign up for credit monitoring. This way you can see where you’re starting – with your credit reports and scores – and follow changes on a regular basis. Check out our exhaustive list of options in 22 Ways to Monitor Your Credit. Creditors can charge off accounts after 180 days (for credit cards) and 120 days (for installment loans). That’s the last thing you want. It not only puts a huge dent in your credit score, but you still owe the debt and will likely now be dealing with a collector. So, do everything you can to bring delinquent accounts up to date before you get into charge-off territory. If you are unable to make full payment to bring the account current, contact the creditor to see about working out a payment plan. This is not the time to distance yourself from the creditor. This is the time to reach out and demonstrate how much you want to bring the account into good standing. Though each of the credit bureaus offers online dispute options, don’t do it. In fact, for any action you request throughout the credit repair process, do so via regular certified mail with return receipt. Include with these letters any supporting documentation and a copy of your credit report – highlighting the item in question – as appropriate. If you find an inaccuracy in a credit report, send a credit dispute letter to the appropriate credit bureau. The same mistake could be on all three reports, but it might not. That’s because data furnishers are not required to report to all three bureaus. So, you may not need to dispute with them all. Here is a sample credit dispute letter to send to the credit bureaus. If you see accounts on your credit reports that are now held by debt collectors, you may be able to request debt validation. The key is doing so within 30 days of the collector’s first communication with you. If they are unable to validate the debt – meaning they cannot prove 1) the debt exists, 2) that it belongs to you, and 3) they have the right to collect on it – the collector must cease collection activity and remove the listing from your credit reports. Here is a sample letter to request debt validation. If a credit bureau does not correct a listing that you still believe to be inaccurate, you can dispute the listing directly with the original creditor or debt collector. Zombie debt is debt that has passed the statute of limitations. Though you still owe the debt, you are no longer legally required to pay it. Check the statute of limitations on debt in your state. If it has passed for an account that a debt collector is still trying to collect from you, send them a letter asking them to stop reporting this zombie debt to the credit bureaus. Even if you know you were late with a payment, there is one way you might be able to get the original creditor to have it removed from your credit report – as a courtesy. Here’s a sample goodwill letter you can use to ask that a late payment be removed. Not because it’s inaccurate, but because 1) it was a long time ago, 2) you’ve built up a history of timely payments ever since, and 3) the late payment listings is not a good indication of your creditworthiness. This is the last type of credit repair letter listed here for a reason – it’s probably best to focus on other issues with your credit report first. Yes, hard inquiries can impact your credit score, but it’s minimal compared to the impact of other negative listings. Plus, hard inquiries stop affecting your credit after 12 months and fall off entirely after 2 years. And you need not worry about soft inquiries affecting your credit at all. Learn more about requesting the removal of inquiries. If you do not receive a response to your letters, don’t be afraid to send follow-ups. Just be sure to give it at least 30 to 45 days from the date on which your return receipt shows your letter was received. Refer to our sample letters for the follow-ups you might need. If you have exhausted every possibility for removing what you believe to be inaccurate information on your credit reports, you have the right to go on record stating that you dispute the listing. This is a 100-word statement that will be included in your credit report for potential lenders to see. This may or may not be a good idea. Weigh the pros and cons of using personal statements. One of the biggest factors affecting your credit score is your credit utilization ratio. That is, the percentage of your available credit that you are using. So, the higher your balances, the worse your credit utilization ratio. As a rule, you don’t want to use more than 30 percent of your available credit at any one time. And, ideally, you want to return credit card balances to zero every month. Bottom line, if you have outstanding credit card debt, get on a plan to pay it off. Many people find success with the debt avalanche and snowball methods. Contact the original creditor and see if they have sold the account to a debt buyer or simply are having it managed by a collection agency. If the original creditor still owns the debt, ask if they’ll take the account back. If you end up paying them, and it’s removed from the domain of the collection agency, the listing should be removed along with it. This may be an especially effective approach for medical debt. Whatever situation you work out, get it in writing before you pay a thing. Avoiding the online dispute process will help ensure you have the kind of paper trail you need. If you are unable to remove information from your credit reports (that you know to be inaccurate) via the credit bureaus, original creditors, or collection agencies, there’s still hope. Submit a complaint to the Consumer Financial Protection (CFPB). They can also help if collectors have violated debt collection laws. For free or a nominal fee, there are several apps you can use to help manage your finances in a way that will ultimately result in better credit. Start with your bank’s app so you can keep a close eye on your account balance and activity. Beyond that, consider apps for budgeting, debt management, and credit monitoring. Here are our picks for the best apps by category. While we’re on the subject, avoid credit repair apps that want you to submit disputes online. Again, send all credit repair letters via regular certified mail with return receipt. Yes, we already mentioned credit monitoring in step 3. But ongoing monitoring of your credit is so crucial that it deserves a second mention – not only to track your credit repair progress, but also to catch future errors or fraudulent activity as soon as possible so as to minimize damage. Bottom line, no matter how good your credit gets, you must monitor your credit on a regular basis if you want it to stay that way. Credit repair takes time. How much time is unique to everyone. It could be 6 months before you see the results you want. On the other end of the spectrum, it could take a couple of years. It all depends on how much you have to address on your credit reports, and how committed you are to the credit repair process and good credit building practices. UPDATE: In the wake of the Equifax hack, your credit repair efforts should also include placing credit freezes on all of your credit reports. Granted, when you have bad credit, fraudsters may not be able to open credit accounts in your name anyway. But with every credit repair step you take, the closer you will get to better credit, so it’s important to have those freezes in place. Learn more about how credit freezes work. Though we have done our best to make this guide as comprehensive as possible, linking to sources where you can learn more, it’s impossible to address everything. If you have questions that you cannot find answers to – on our site or anywhere else – please ask in our free, friendly credit repair forum. And if you do decide to use a credit repair company, make sure it’s a good one.